The fall of 2018 will not be remember for good astronomy by people in the Mid-Atlantic states. Hurricanes Florence and Michael made a mess of things in September and October, respectively. However, in October, there were 2 star parties scheduled, ECVAR (East Coast Video Astronomy Rendezvous) and SRSP (Staunton River Star Party). My plans, which included fellow Raleigh Astronomy Club members and friends Rob and Paul, were to spend 4 nights at ECVAR and then 4 nights at the Staunton River Star Party hosted by Staunton River State Park in VA. We were to arrive on Saturday for ECVAR, then depart Wednesday morning for SRSP, arrive Wednesday afternoon at SRSP and depart SRSP on Sunday. How does that axiom go, “The best laid plans of mice and men often go astray.” Well they certainly did. While we arrive on Saturday and set up the RVs and campers, it was too windy to do anything by look thru binoculars. Sunday we were able to set up our telescope gear and get a few hours of observing before the clouds rolled in and shut us down for the entire night. From there the weather took a turn for the worse. Monday was completely cloudy and then the rains began on Tuesday. This weather, as it turns out, was not the remnants of Hurricane Michael but rather the storm front that drove Hurricane Michael eastward across the Carolinas. We decided to wait out the storms at Cool Breeze Campground which had full RV hookups, including 30 amp and 50 amp electrical, gravel RV pad and good WiFi on the field where we were set up. 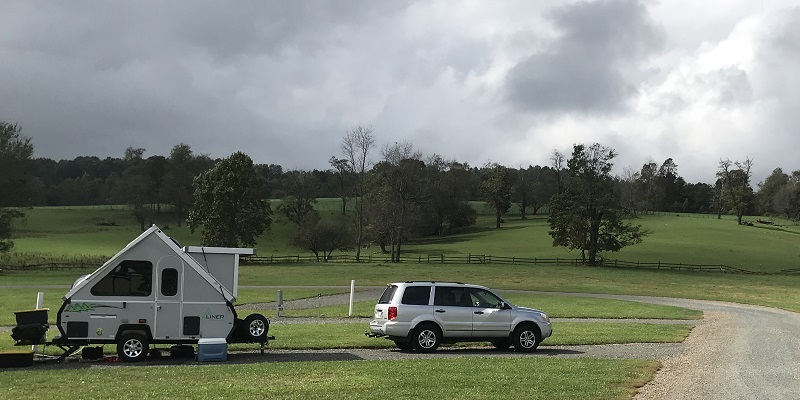 The alternative was to take our changes at SRSP with limited field power, 20 amps connections on a wet, grassy parking and no WiFi. It’s a good thing we stayed as the park lost power and sustained a fair amount of wind damage. At ECVAR, it rained from mid Tuesday to mid Friday, over 6 inches of rain. Friday night cleared up but it was too windy to observe. Finally Saturday we had a few hours of observing before the clouds came back and a lured us out with sucker holes late in the evening. In the end, I was able to get some great views with my new camera setup, a ZWO ASI385NC Cooled camera. Here are 2 shots, M16 – The Eagle Nebula and M27 – The Dumbbell Nebula.